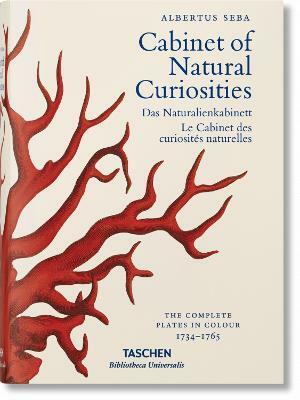 The Cabinet of Natural Curiosities is one of the 18th century's greatest natural history achievements and remains one of the most prized natural history books of all time. Though scientists of his era often collected natural specimens for research purposes, Amsterdam-based pharmacist Albertus Seba (1665-1736) was unrivaled in his passion. His amazing collection of animals, plants and insects from all around the world gained international fame during his lifetime. In 1731, after decades of collecting, Seba commissioned careful and often scenic illustrations of every specimen. With these meticulous drawings, he arranged for the publication of a four-volume catalog, covering the entire collection from strange and exotic plants to snakes, frogs, crocodiles, shellfish, corals, birds, and butterflies, as well as now extinct creatures. This reproduction is taken from a rare, hand-colored original. The introduction supplies background information about the fascinating tradition of natural collections to which Seba's curiosities belonged. "Ein gewaltiger Beweis für die Schönheit und Vielfalt der Natur." "A powerful testament to nature's beauty and diversity." Irmgard Musch, born in 1967, studied art history, history and classical archaeology in Mainz and Berlin. Her Ph.D. thesis from 1999 examines Johann Jakob Scheuchzer's Kupfer-Bibel, a richly illustrated scientific commentary on the Bible from the early 18th century. She has published on art of the 18th and 20th century, scientific illustrations and Kunstkammer pieces. Jes Rust, born 1963, completed his studies in geology, palaeontology and zoology at Gottingen and Kiel. His thesis dealt with the evolution of fossil snails living in the fresh and brackish waters of prehistoric Greece. His assistantship at the Institute of Zoology in Gottingen between 1993 and 1999 was followed by his appointment in 2001 as professor of invertebrate palaeontology and insect phylogeny at the University of Bonn. Rainer Willmann holds a chair in zoology at Gottingen University, is director of its Zoological Museum, and is co-founder of its Centre for Biodiversity and Ecology Research. A specialist in phlogenetics and evolution, he conducts research into biodiversity and its history.